Yoga & Crystal Healing is a perfect union of the yoga system and the therapeutic energies of crystals. We have come to a new age to explore various possibilities of the loving energies through crystals while we embrace our very own core potentials in our body, mind and heart. Yoga & Crystal Healing brings in the various authentic yoga schemes ranging from Yin Yoga, Hatha Yoga to Hatha Flow with a new touch in asana, meditation techniques and spiritual understandings by adding hues with the crystal healing properties. They collaborate as One to honor a profound holistic establishment within our human system in deep detoxification, prevention of sickness and strengthening of the organs and physical vessel. Thus, it is commonly known that individuals will amplify their self-love and self-acceptance through this yoga practice. By utilizing the therapeutic energies, frequencies and light, Yoga & Crystal Healing provides a strong connection and understanding of our energy bodies of physical, emotional, mental and spiritual. This approach highlights and magnifies the harmony of masculine (sun) and feminine (moon) energies by empowering us to encompass in all the aspects of existence into ourselves. Ultimately, we will experience and enjoy the true loving essence of our Being. Promotes healing, durability, flexibility and vitality to our body. Harmonize the functions of the left and right brains to create a balanced state. Releases blockages and dis-ease of our Chakra System. Heals and soothes the functions and operations of our energy bodies. Empowers and amplifies love, joy, peace and positivity in our being. The chosen crystal(s) required by the facilitator. A set of yoga attire eg. fitted t-shirt and long pants, preferably cotton-made. Time:	7:15 p.m. - 8:30 p.m.
Kindly contact the personnel of the above holistic center or refer to their website for the fee of this class. "Tristen refers to himself as a yoga coach, but I like to think of him as a Life Coach. Yoga is not only a great way to work out physically, but when practiced with the right frame of mind and with inspired guidance, it literally becomes a way of life. Tristen’s sessions start with a short discussion and simple meditation to ground you and bring you to the present, leaving all worries and problems behind. It really is a useful tool to use anytime you are feeling stressed or worked up even in the office or at home! Tristen is naturally intuitive and his sessions seem to flow with the general energy level of the class. He likens his approach to yoga as that of his approach to life – get into it without preconceived ideas, get to know your own abilities and always try to improve and grow to your potential. All this with a generous dose of compassion, not only towards others’ feelings and abilities, but also towards yourself. Every asana has its purpose towards improving your well-being so should not be forced. You are encouraged instead, to find your own level and work from there. Tristen is not only passionate about teaching yoga, but is also a natural healer and spiritual intuitive. He brings something special to his sessions and I always feel energised, recharged physically and mentally and slightly euphoric at the end of each session!" "I enjoy the yoga class teaches by Tristen. It gives me more energy by relaxing my body especially it helps me a lot in practicing meditation. Tristen infuses the joy of yoga, with discipline of it, creating classes that teach the body and mind connection. He teaches the class with sensitivity, warmth, compassion and style by integrating the class with spiritual teaching. 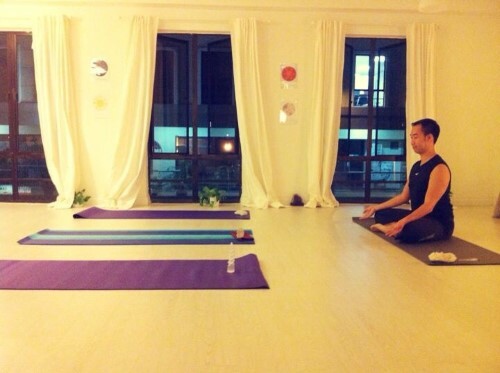 This makes his yoga classes very invigorating and inspiring. My body's alignment is more elongated. I am more relaxed and mentally centered. It helps my sanity and releases my stress. I have an overall feeling of well-being. I would recommend this yoga class to anyone interested in developing a yoga practice to improve their body composition, tone their muscles, as well as gaining the tools for having greater health and practicing meditation." "If you think yoga is for lady only and yoga is not a form of exercise, perhaps you should seriously consider paying one-time fee by joining Tristen for one session and you may realize that what you have perceived is different from what you may experience. The experience is much more better than any body message. For me, body message only relax my body and it doesn’t relax my mind. Asthanga yoga is different – it relaxes my mind. Experience is worth more than a thousand words, please do yourself a favour."